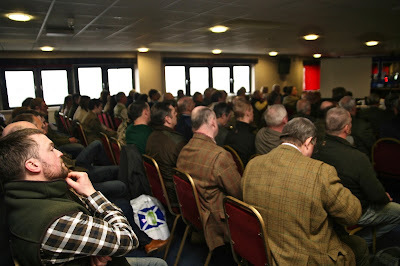 Image from SGA AGM, Inverness. The SGA Fishing Group will be meeting at the Perth office on April 21st 2016 at 7.30pm to discuss future priorities and group responses to the ongoing Wild Fisheries review, which will have significant impacts for river workers. Since establishment, the SGA Fishing Group has had little time to pull together its membership, going headlong into the reform process and salmon conservation debates from day one. This meeting is a rare chance to get the heads up, assess future priorities going forward and to ensure the group has the proper input to influence legislation that will affect all of us within a very short space of time. If you are a member of the group but feel a non-member may be able to assist our efforts or bring something to the table, please bring them along, too. We are looking to build representation across Scotland and everyone has a role to play, even if time is at a premium. If you are attending, please contact carol@scottishgamekeepers.co.uk to make the office aware that you are coming. We look forward to seeing you on the night. 1/ Member Priorities: What matters most now and what needs to be tackled to benefit river workers in Scotland? 2/ Wild Fisheries Reform: How do we best represent river workers’ views? 3/ Reform progress to date. 4/ Building the knowledge base of the group to maximise impact. Forming a specialised sub-group dealing with fishing issues only. Venue: Inveralmond Business Centre. 6 Auld Bond Road, South Inveralmond, Perth, PH1 3FX. Attendees should go to the car park to the right of the entrance and enter the building by the side door, sign-posted Balfour Beattie. Someone will be there to let you in. If you are a little beyond 7.30pm, buzz and someone will release the door.